Doughnuts probably come into mind from the first mention of Bavarian cream. Try to go to doughnut stores (such as Krispy Kreme, Dunkin’ Donuts, Tim Horton’s) and purchase one of each kind of their custard cream-filled doughnuts (i.e. Boston cream, Long Johns, etc.) including the Bavarian cream. Chances are you will conclude that the members of this doughnut family only vary according to the type of exterior frosting because their fillings have the identical decadently sweet taste and oozingly creamy texture to the confectionary sugar-dusted Bavarian cream doughnut. So what is a Bavarian cream then? Bavarois or Bavarian cream in English is a cold unmolded custard cream or crème anglaise that has been thickened with cornstarch and gelatin. Unfortunately, the term has become a misnomer and thus, is misused nowadays in the American kitchen. Authentic bavarian creams are less fluid because their gelatin to custard ratios are higher than that of the doughnut filling. 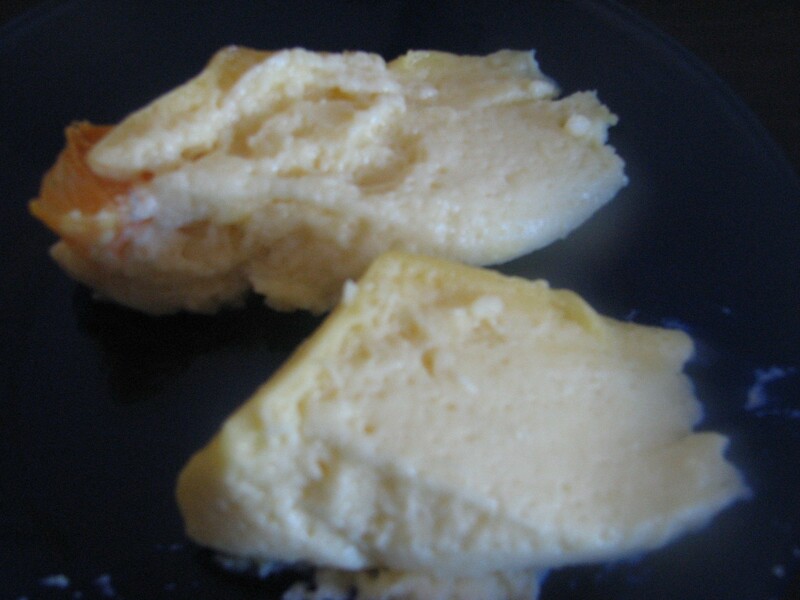 At a semi-solid state under cold temperatures, the hydrolyzed collagen fragments in the gelatin increase the viscosity and the rigidity of the custard. Hence, try piping a true Bavarian cream into a warm empty doughnut. You will probably feel either a resistance in the flow of the Bavarian cream or no flow at all. Since Bavarian creams contain gelatin, it is also easy to mistake them as mousse in the culinary context. Actually, the “mousse” layers in cakes are Bavarian creams because a true mousse does not have any gelatin. This dessert (bavarois) is not to be confused with creme bavaroise (or simply bavaroise) either. Although both words literally translate to Bavarian cream, the former was introduced in Germany by a French chef who was working in Bavaria (Larousse Gastronomique 1977). The latter is a hot crème anglaise and tea beverage that was invented in France to appease the demands of visiting Bavarian princes (Larousse Gastronomique, 1977). If the Bavarian cream mold is hexagonal in shape, the nationality changes to Russian and becomes a Moscovite (Larousse Gastronomique, 1977). Much like ice cream, Bavarian cream can come in different flavors. The repertoire includes chocolate, strawberry, vanilla, mocha/coffee, almond, raspberry, apricot, peach, pear, pistachio, applesauce, champagne, lemon and cloves (a.k.a. perfect love), hazelnut, banana, orange, chestnut and even roses. 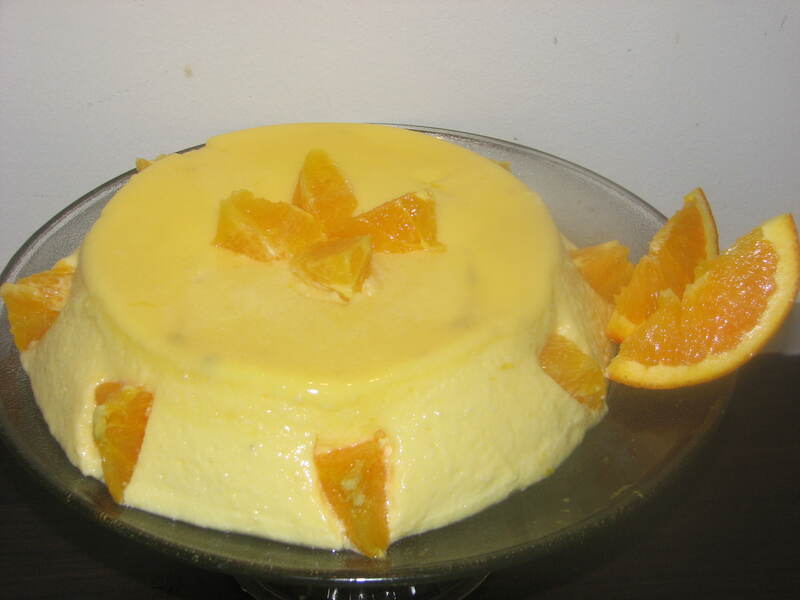 For this blog entry, I will focus on Orange Bavarian Cream (from Mastering The Art of French Cooking) because one of its steps has a scientific aspect that is not found in other flavors – extraction of the orange flavor using sugar. The procedure may sound bizarrely sophisticated but it is simple and intelligent by design. While laboratory techniques taught in organic chemistry may prove useful, obtaining orange oil/flavor through steam distillation or solvent infusion (soaking) of the orange rind/peel are both unreasonable and impossible to perform inside an ordinary kitchen for safety and toxicity reasons. Liquid nitrogen can be used but this method demands high costs and accessibility issues – pretty impractical for isolation of orange oil at home. Dry ice will work as a cheaper substitute but this requires high pressure and high temperature such as being done in a pressure cooker and there is the potential of the oil imparting a metallic flavor and taste. Decoction or boiling the orange peel in milk is a feasible method but the loss of orange flavor through vaporization from boiling cannot be controlled. 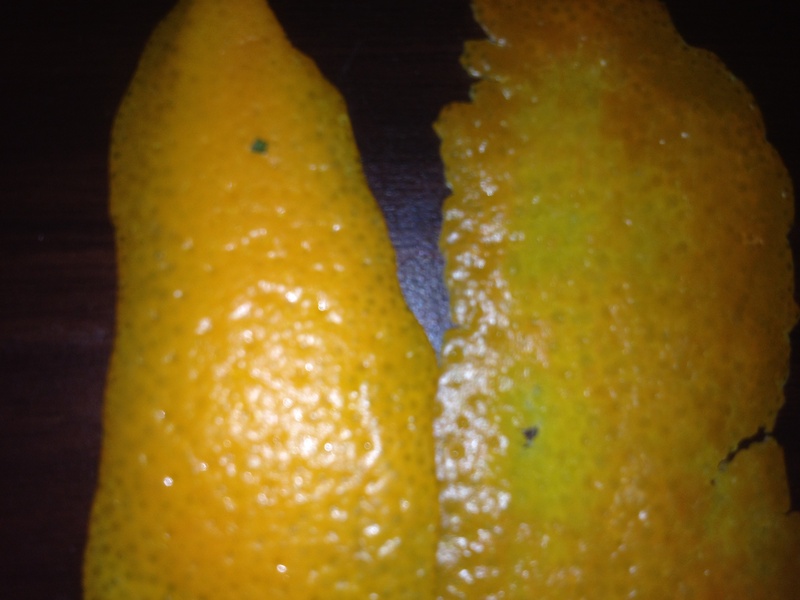 The photo above shows you the difference between orange peels before (left) and after (right) being scrubbed with sugar. Pardon my photography skills with an iPhone but you may notice yellow regions on the right orange peel. Before rubbing with sugar, the peel does not only have the orange color but the surface also feels wrinkled. When the oil is transferred into the sugar, the surface of the peel loses the orange color and thins out to a smoother layer. This is somewhat similar to skin exfoliation. The white sugar, on the other hand, will turn yellow (from the carotene of the orange peel), smell citrus (from the limonene found in oranges) and appear syrupy. After all this science and linguistic talk, you are probably hungry and curious on how my Orange Bavarian Cream turned out. Though the dessert looked jiggly, the dessert was decadently creamy and smooth. Once I had a sample inside my mouth, I felt the softness that the custard was melting inside my mouth. The fluffiness of the custard made the dining experience felt like eating a cloud. The flavor was not overpowering to the sweet taste of the custard even with the combination of the orange juice, orange liqueur and orange oil. I died and went to heaven from having this bavarois and I can’t wait to do it all over again. 1. Wash and dry the oranges. Rub the sugar over the skin of the orange. If lumps of sugar are being used, mash the sugar lumps and zest the orange peel into the sugar. If granulated sugar is being used, the oil will definitely get into your hands. To solve this problem, scrape the oil from your hands with a spatula. 2. Squeeze the orange juice and sprinkle gelatin over the orange juice. 3. Beat the egg yolks into the orange flavored sugar. Gradually add the granulated sugar while beating until the mixture is pale yellow. Beat in the cornstarch. 4. Pour the milk into the beaten egg yolk mixture in a thin stream of droplets. 5. Return the resulting custard sauce into the saucepan. Thicken the mixture over moderate heat. Make sure to stir with a spoon or a spatula. (Tip: To find out that the custard is thick, coat the spoon or spatula with the custard. If you run your finger on the custard sauce and the coating does not fill the line that you made, then the custard sauce is thick.) Do not overheat or overcook otherwise, the egg yolks will curdle and will separate from the milk. 5. Dissolve the orange juice-gelatin mixture into the custard sauce immediately after removing the saucepan from the heat. Pour into a mixing bowl. 6. Beat the egg whites, salt and sugar until stiff peaks are formed. Fold the egg whites into the cooling custard. 7. Transfer the bowl to the ice bath. Fold the mixture frequently to prevent separation of the custard from the egg whites. When the mixture is cold, set aside. 8. Place a mixing bowl containing the whipped cream under ice bath. Beat the cream until volume doubles. 9. Fold the cream and orange liqueur into the custard. 10. Transfer the entire Bavarian cream into mold. Cover with wax paper and chill the mold for 3-4 hours or overnight. 11. To unmold, dip the container into hot water for one second. Run a long thin knife around the edges of the cream. Reverse on the serving platter. 12. Garnish with orange segments.